Mark comes from the small historic market town of Barnard Castle in County Durham in the North East of England. With several years of experience as a professional performer, Mark has entertained all over the UK: from the North East, North Yorkshire & Cumbria, down to the Midlands, Southampton & South Wales. Having entertained in Pubs, Clubs, Hotels, Casinos, Holiday Camps & Residential Homes; he recieves rave reviews wherever he goes, with his 'audience friendly' banter & participation. 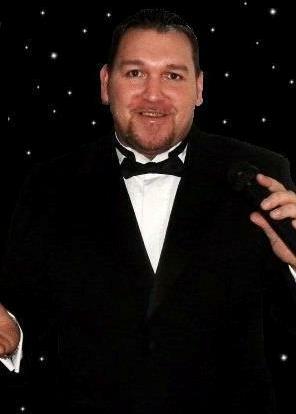 Mark is regularly booked for Presentation Nights, Charity Events, Weddings, Anniversaries & Birthdays. And now, with the addition of a fantastic lightshow, he can also provide a Disco as well, to cover your whole nights entertainment. Nominated 'Best Newcomer' in 2009, as well as named 'Male Vocalist of The Year 2011 & 2012' in North East Clubland; Mark has also helped raise money for Cancer Research UK, Help For Heroes, North East Air Ambulance & Disadvantaged Children, to name but a few. With a superb show, jam packed with No. 1 hits specialising in the Swing, Rat Pack, 50s, 60s & Rock n Roll eras; Mark also throws in a bit of the Motown, Country, Doo Wop, Rockabilly, 70s, 80s & 90s for good measure. Additionally, Mark can perform a specialised Rat Pack / Swing show with hits from Frank Sinatra, Dean Martin, Bobby Darin, Robbie Williams & Michael Bublé, which is ideal for any event. "Mark is a superb Artiste & Vocalist, songs for all occasions, highly recommended." "Fantastic afternoon had by all, out of all the acts we have had here, we have never ever known the residents to interact, but you had us all clapping, singing & dancing along, we will definately have you back..."